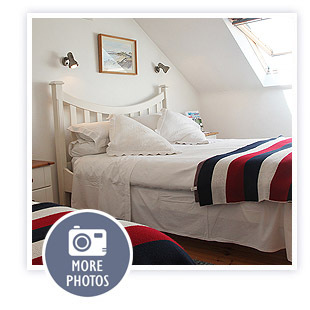 The Crows Nest is a loft bedroom with stunning sea views. Guests can enjoy one double bed and one single bed in this room, which includes an en-suite bath and shower room. Decorated with a seaside cottage feel, guests frequently let us know how much they enjoy falling asleep whilst hearing the waves lapping against the shoreline outside their window.